Europe’s newspapers were overwhelmingly negative towards Britain’s vote to leave the European Union, according to a review of the press in 13 countries in the week after the referendum. Most articles presented the view that Brexit was bad for the EU, would damage their own nation’s interests and would also be bad for Britain. 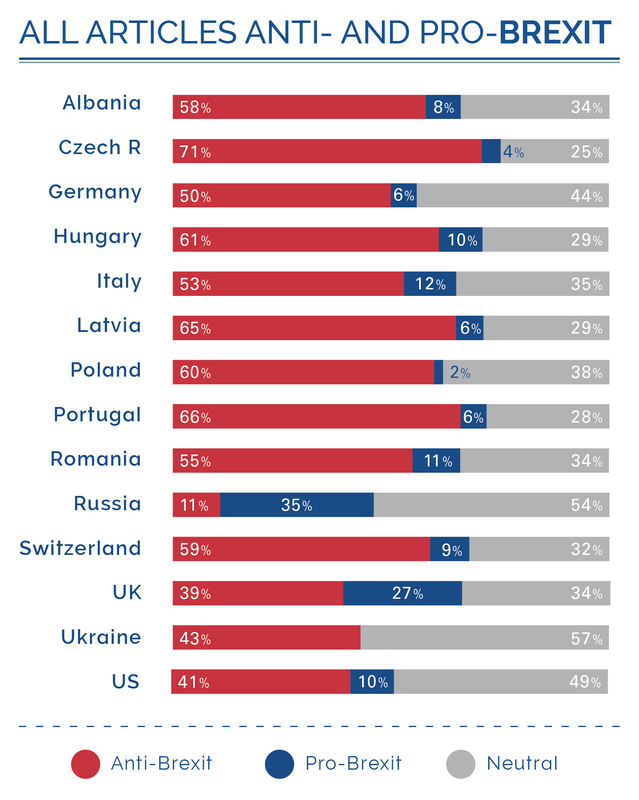 Of the articles that discussed the possibility of following Britain out of the EU, the majority concluded it would not be in their country’s interest to do so. A strong theme was that Brexit highlighted problems within the EU. However the majority view, across all political opinions, was that it should be reformed rather than be allowed to fail. Most also agreed the EU would be worse off without Britain (81 articles, compared to 14). 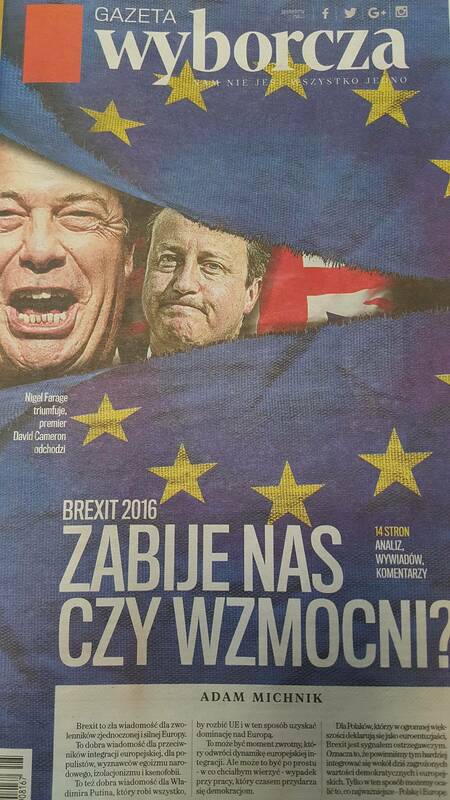 One Hungarian newspaper argued the EU was only a “rump” without the United Kingdom. 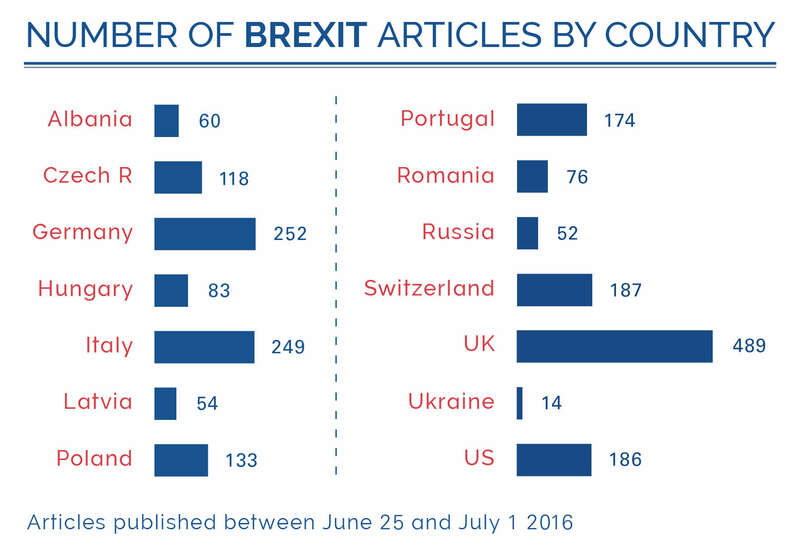 Only one country, Russia, had more positive than negative articles about Brexit. The European Journalism Observatory conducted a content analysis of the print editions of three daily newspapers in each of 12 European countries and also in the United States, between June 25 and July 1. 1638 articles about Brexit were examined in newspapers representing a broad spectrum of political opinion. Countries included EU members and non-members: Albania, Czech Republic, Germany, Hungary, Italy, Latvia, Poland, Portugal, Romania, Russia, Switzerland, Ukraine and the US. In a related study 489 articles were also analysed in three British newspapers over the same period. Coding was based on the predominant theme that framed each article. Each was judged negative (anti-Brexit), positive (pro-Brexit) or neutral on questions regarding: the impact of Brexit upon the EU and on the national interests of member and non-member states; whether the EU was better off with, or without Britain; if members were in favour of leaving or remaining in the EU and also on the perceived impact of Brexit upon the UK. Overall 56% of articles in European and US newspapers were judged anti-Brexit. Only 8% of articles were pro-Brexit and 36% were neutral. In the UK analysis, of the three newspapers studied (The Telegraph, Guardian and Daily Mail) two had backed the leave campaign, yet coverage after the vote was mostly anti-Brexit (39%), 27% pro-Brexit and 34% neutral. European and US newspapers, whatever their political leaning, reported “stunned surprise” and “dismay” after the referendum. While left-wing newspapers were more strongly in favour of the EU and more critical of the outcome of Britain’s referendum arguing it could damage the EU; right-wing newspapers were also generally negative towards Brexit, although their analysis tended to be more understanding towards the reasons behind Britain’s vote to leave. EU founding members, Germany and Italy, published the most articles about the referendum result. In Germany 252 articles were published in the six days between June 25th and July 1 (no editions were published on Sunday), in Süddeutsche Zeitung, Bild and Frankfurter Allgemeine Zeitung (FAZ). Most (62) articles across these three papers argued that Brexit would have a negative impact upon Britain, only one said it would have a positive impact. 40 articles suggested that Brexit would be bad for the EU, only four said it would be good for the EU. In FAZ, a leading conservative daily, Brexit was depicted as major crisis for the EU. “Every commentary – without exception – was very critical of the EU politics and the decisions made by the EU in the past. The need for EU reform was a golden thread,” said Gordon Wüllner, a researcher from the Erich Brost Institute, the EJO’s German partner. In Italy 249 articles were published between Corriere della Sera, La Repubblica and Il Giornale of which most (132) were negative, 29 positive and 88 neutral. Despite the anti-Brexit views in western Europe’s quality newspapers some of the most enthusiastic pro-brexit coverage appeared in a popular western European right-wing daily, Italy’s il Giornale (owned by Silvio Berlusconi’s family). Il Giornale depicted Brexit as a victory for the people over EU-hierarchies. It published 20 articles defining Brexit as positive, eight defining Brexit as negative (because of its potential economic impact on Italy) and 17 neutral articles. This newspaper also published two of the four articles published across all newspapers that discussed following the UK out of the EU as an option. Others were in FAZ and in Portugal’s Público, (34 articles argued against leaving). In general coverage in tabloid and popular newspapers was more superficial and often focussed on issues such as immigration, racism and migrant workers in the UK. 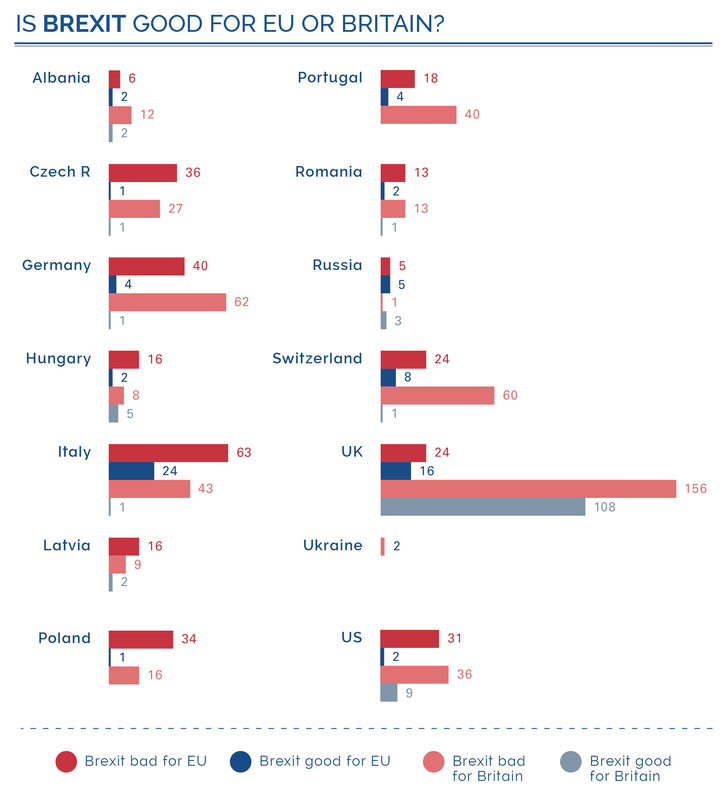 Central Eastern European countries, including the EU’s newest members as well as those hoping to join, such as Albania, were also predominantly negative about Brexit and positive about the EU. 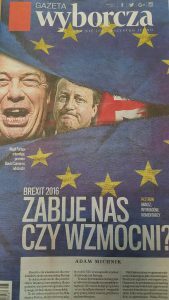 The Czech Republic newspapers published 84 anti-Brexit articles out of 118 including six that argued against following the UK out of Europe. Only five articles in the Czech Republic discussed positive aspects of Brexit; 29 were neutral. Many central and eastern European member countries raised concerns over the fate of their citizens living and working, or hoping to work in the UK however, this did not feature as prominently in their coverage as discussions about the broader implications of Brexit. In Poland only Fakt, a tabloid newspaper, widely reported aggression towards Polish nationals living in the UK in any detail. In Latvia national economic concerns were also highlighted over concerns about Latvian nationals in the UK. Romania’s press also discussed migrant workers, but alongside analytical articles about the country’s future role in the EU. Romanian articles used a negative tone to describe the result of the vote overall, using expressions such as “disastrous decision”, and “shocking news”. Hungary’s left-wing paper, Népszabadság, argued that the Hungarian prime minister, Victor Orban, should cease his anti-EU statements because the EU must be strengthened rather than denigrated. Most (51 of 83) articles in Hungary’s press were negative and only eight supported Brexit, 24 were neutral. Portugal, an EU member since 1986, has been threatened with sanctions for not meeting its budget target last year. Despite this the country’s press was mostly anti-Brexit and pro-EU. There was a perception that Britain leaving the EU would harm Portugal’s economic interests (17 articles) and would also be bad for tourism and for Portuguese workers in the UK. Only one article (of 174) advocated following the UK out of the EU, but seven concluded staying in the EU was better for Portugal. Of all 13 countries studied, only Russia, a non-member, had no articles stating Brexit would damage its national interest. Instead, of 52 articles, 13 outlined why Brexit would be good for Russia, 12 of these appeared on Regnum, a conservative pro-Putin outlet. Articles about Russia’s role in Brexit featured prominently in central and eastern European coverage, but also in US newspapers (21 of 186 US articles mentioned Russia). The common view was that Russia would benefit from Brexit because EU sanctions on Russia would be harder to impose without British support. ‘Divided EU good for Russia’ was one of many similar comments in Gazeta Wyborcza, a Polish newspaper. Most of Russia’s domestic coverage consisted of “short news about Brexit-related events without providing interpretation or authorial comments,” said Andrejs Berdnikovs, editor of EJO Russia. Berdnikovs said that while overt political statements were avoided, the media coverage was selective. “The decision of which quotes to use was dependent on portals’ ideological stance. Thus, conservative REGNUM tended to present an atmosphere of confusion among ruling European politicians, normally trying to make Pro-Europeanists sound naïve and trivial (“Moldova should strengthen efforts towards European integration, because it can bring Moldovan citizens welfare, social solidarity, good laws and respect”), but eurosceptics – witty and wise (“The EU is a project with a past but without a future”),” Berdnikovs said. Oppositional portal Новая газета (Novaya Gazeta) was almost completely neutral towards Brexit, only slightly expressing concerns about the dangers of right-wing populism in Europe. Likewise, tabloid Московский Комсомолец (Moskovskiy Komsomolets, ) lacked an evaluative outlook,” Berdnikovs added. Switzerland: Brexit bad for Britain – and Switzerland? Often seen as a model of how to exist outside the EU, Switzerland is not a member but participates in Europe’s single market through 120 bi-lateral agreements – and maintains a close interest in EU politics. Most articles in the three Swiss newspapers studied were negative towards Brexit. For example, 60 articles concluded Brexit would be bad for Britain, compared to only one that argued the opposite. The left-liberal (Tagesanzeiger) and right-liberal (NZZ) newspapers were negative in slightly different ways. According to Filip Dingerkus of the Zurich University of Applied Sciences Winterthur, who conducted the research, Tagesanzeiger depicted the UK vote as a threat to European unity, while NZZ argued Brexit illustrated the EU’s problems. Despite an initial optimism among Swiss politicians that Brexit might boost the country’s negotiating position within the EU, the majority view was that it would not make a significant difference. 21 articles (of 187) concluded that Brexit would not be benefit the Swiss economy, compared to seven that argued it would. One of the most noteworthy aspects of Brexit coverage in the US media was the volume of mainstream news coverage devoted to the subject by the two leading national newspapers. “Brexit generated headline news day after day – an unusual spotlight on Europe by the US-centric press,” said Scott Maier, associate professor of journalism at the University of Oregon, the EJO’s US partner. Of the 186 stories published in the Wall Street Journal (WSJ), The New York Times (NYT) and New York Post, in the week after the UK vote, 31 argued Brexit was bad for Europe, only two opposed that view, while 39 were neutral. US commentators were more evenly split on whether Brexit could benefit US national interest, with eight articles arguing it would and six taking the opposite view. News stories framing Brexit in a positive light were relatively rare in both The Wall Street Journal and The New York Times, with coverage “somewhat evenly split between neutral and negative in tone,” Maier said. “The negative stories tended to reflect external realities – collapsing markets, economic uncertainty, political turmoil – rather than a partisan viewpoint. Few stories were stridently opinionated – even commentary was surprisingly nuanced and even-handed,” he added. Even the tabloid newspaper studied, Rupert Murdoch’s News Corp’s New York Post, was “overwhelmingly even-handed,” Maier said. The dominant theme in the NYT’s coverage of Brexit was negative consequences for the UK as a country. 17 out of 64 stories fell into this category. 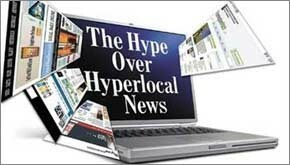 The negative tone is also reflected in headlines that included words such as fear, anger, frustration, chaos, panic, turmoil, populist revolt, confusion. Poland: Gazeta Wyborcza, Rzeczpospolita, and Fakt. How Europe’s Media Covered Brexit is part of an ongoing collaborative journalistic research project by the European Journalism Observatory. The analysis was conducted at 14 universities and research institutes across Europe and the US. Articles were coded according to the dominant theme in their content, judged by the headline and top five paragraphs. 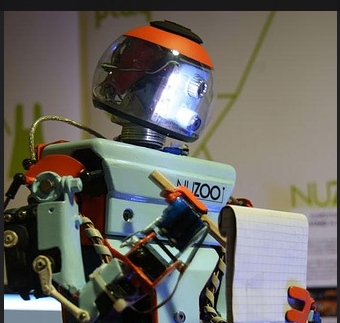 Coding was based on a set of criteria based on language, terminology and phrasing. Three newspapers in each country were chosen for their influence and also to represent a broad range of political opinions. Where possible, one left, one right and one popular/tabloid newspaper was studied in each country. In most cases editions were only published on weekdays, but where Sunday editions were published they were also coded. Latvia and Ukraine had fewer editions as public holidays meant there were no newspapers on at least one day, apart from Sunday in both these countries. Russian outlets were accessed online, as the coding was conducted in Latvia. Research: Is Digitalisation Killing Photojournalism?